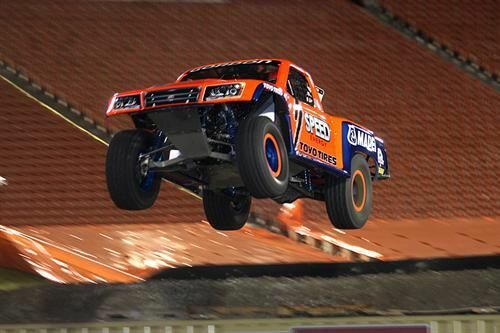 Robby Gordon took both the qualifying and the race win at the third Stadium SUPER Trucks event in the Los Angeles Memorial Coliseum. On a pavement/dirt mix, Gordon couldn't be stopped. Competing on his home turf, #7 Speed Energy Robby Gordon took both the qualifying speed and race win as the official numbers from the latest Stadium SUPER Trucks event are released. This third event for the season had racers on a pavement, turf and dirt mix, which proved to be favorable to the Orange, California native as Gordon took an early lead and held it for most of the race. The 20-lap race took place in the historic Los Angeles Memorial Coliseum, with competitors first running qualifying speed trials to determine their place in the starting lineup. Gordon outclassed all others by a full two seconds, holding the pole position. One racer disqualified after rolling his truck in a curve. During the actual race the next day, the starting line quickly staggered as the mixed roadway saw some having control problems through curves and over jumps. Gordon took advantage, grabbing the lead early on, and while there was some back-and-force, he held it until the finish line twenty laps later. Rob MacCachren, winner last week, took second place. PJ Jones took third in a solid performance through the last few laps, beating out contenders Lofton and Brawley, who'd vied for the spot. The race course had an interesting cross-over option, which one racer, Ricky Johnson, tried to take advantage of to gain the lead position. It wasn't as easy as all that, however, and a blown tire threw him off course into the paristyle, ending his race for the night. A rollover in the twelfth lap took Arie Luyendyk, Jr. out of contention. The re-start lap after that had Justin Lofton lose teh handle on his peristyle round, dropping back to an unrecoverable rear position and giving Jones the opportunity to vie up for third place. Another great night of racing for Stadium SUPER Trucks. The next event will be in San Diego.